Since science has proven that it boosts the immune system, chicken soup has come to deserve its reputation as “Jewish penicillin.” It is not a case that even doctors recommend it during the cold season to fend off airborne infections to the body weakened by the dropping temperatures. Research actually shows that it might lengthen it via suppression of white blood cell movement, but the same study also suggests that chicken soup – the “grandma’s recipe” in this study included chicken, onions, sweet potatoes, parsnips, turnips, carrots, celery stems, parsley, salt and pepper – may contain a number of substances with beneficial medicinal activity. The study focused on finding out if the movement of neutrophils – the most common white cell in the blood that defends the body against infection – would be blocked or reduced by chicken soup. Researchers suspected the reduction in movement of neutrophils was reducing activity in the upper respiratory tract, causing the symptoms associated with a cold. Strangely enough, when compared to other sources, bone broth calcium levels are low(**) and additional calcium conteining foods will be needed even when consuming bone broth daily. Besides calcium and magnesium, it contains phosphorus, silicon, sulphur and others trace minerals in a form that the body can easily absorb. In their book “Nourishing Broth”, Sally Fallon Morrel and Kaayla Daniel, explain how the abundance of collagen in all types of bone broth promotes heart health through strong and supple arteries, vision with healthy corneas, digestion through gut healing, and overall disease prevention via immune system modulation. While deficiencies in collagen and other nutrients causes brittle hair and nails, underdeveloped musculature, premature skin aging, osteoarthritis, osteoporosis, gut disorders, and autoimmune disease. All of them can be remedied with the help of genuine old- fashioned bone broth. Furthermore, broth even contributes to emotional stability and a positive mental attitude. Our ancestor consumed bone marrow every time an animal was caught and butchered for good reasons, as it seems to contain the right ingredients for healing and rejuvenation. Few people realize that marrow is one of the largest organs in the human body, and most importantly a primary lymphatic organ. Humane bone marrow contains a small amount of lipids, in the form of many different forms of choline of which a large amount is constituted by lecithin, and a small amount by phosphatidylethanolamine (PE) and phosphatidylserine (PS). These are extremely important, because they are vital to nervous system function. They are found heavily in the white matter of the brain, nerves, neural tissue, and the spinal cord. PS is known to improve brain function and mental acuity. Consumig bone broth regularly allows cut backs on the amount complete protein we would otherwise need to eat. Consuming large quantities of steaks, chops and other muscle meats as recommended on many diet plans, can cause premature aging through a process of methylation at a cellular level. The Weston A. 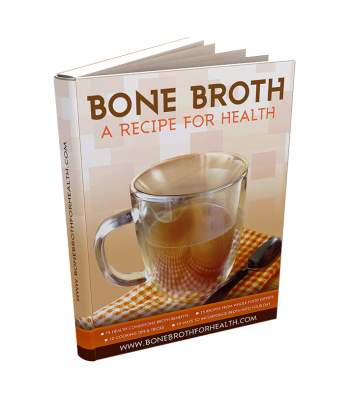 Price Foundation reiterates the importance of bone broth as a healing food for convalescents, because it helps prevent unwanted weight loss and loss of muscle which occurs when the body goes out of nitrogen balance and cannibalizes the protein stored in its own muscles. It is important to use only grass-fed, organic and non-GMO products, to avoid toxicity and get the full benefits of both healthy animal and vegetable products. Studies conducted in the United Kingdom have shown dangerous amounts of lead in broth made with non-organic chicken. Get to know your local butcher. Lately, mine has become my best friend, because it’s not always easy to find good quality meats and a varity of bones. You need somebody you can trust. A good solution, especially in big cities is to subscribe to a CSA (Community-supported agriculture), and even buy a share on a whole animal while is still out in pasture makes a lot of sense. Two or more families can do this together or you could partner with family or friends. To find local CSAs in your area go to the Local Harvest website. The Weston A. Price Foundation website lists leaders of its local chapters nationwide. They wil help you find locally-grown organic and biodynamic vegetables, fruits and grains; and milk products, butter, eggs, chicken and meat from pasture-fed animals. I also add any withered vegetables sitting in the fridge. I brown additional meat in some bacon fat, ghee or extra virgin raw coconut oil. You want your broth to gel solid when cold. Longer simmers than what is specified above, will create shorter collagen molecules that will not yield solid gelatin. Add meat, bones, and feet to the pot (pot should be filled with the bones), cover all with filtered water. Add 2 tablespoons of organic raw apple cider vinegar to the water. and let it soak with the bones 1/2 hour before turning on the stove. When it starts simmering, skim off foam and scum, then add the vegetables. It should never be a rolling boil. After it starts boiling turn the burner down to simmer. The simmering needs to be barely visible. You might want to add a spacer between the pot and the burner. Remove any impurities, foam or scum as they surface. Grass-fed organic bones usually produce little to none. Periodically, add water to bring the broth back to level. When cold, even before refrigeration bone broth should have a solid gelatinous consistency. Once refrigerated you can remove the fat solids for better taste. I like to keep some of the fat in my broth. I use a wisk to emulsify it into the broth before drink it. I let it simmer during the day, about 8-12 hrs, or keep track of time during the night if needs to simmer some more. Remember, longer simmers yeld more out of the bones, but do not let go over the times listed above or you will loose the gelatin-collagen benefits. Save bones from your roasted chicken, osso buco, steaks, backribs dishes, etc. refrigerate them or freeze them, then add them to your broth. Always include some bones for marrow in your broth. Chicken skin, heads and wings – if you can find them – make excellent broth. So do lamb necks, and heads, cows feet, pork jowls, skins, ears and tails – lots of collagen. Veal tracheas have a lot of good collagen as well, but they are not easy to find. Ox tail would be good too, but I believe it deserves to be prepared on its own, see my recipe ‘coda alla vaccinara’ revisited for an excellent dish. In short, all of those odd parts of the animal, that nobody would ever hink of buying – or selling – bacause they are considered poor cuts of meat, would make an excellent and nutritious broth. It is better to use an enameled pot, a Dutch oven, a large earthenware or a stainless steel one. Do not use an iron or aluminum pot. Traditionally, chefs and cooks develop a signature broth that is used as stock in most of their recipes. I started using broth almost daily in my cooking, developing an eclectic number of delicious meals. Bone broth makes delicious both hot and cold soups. I like to make it into pudding adding eggs and raw coconut flour.I even revived two of my mother favorites, eggdropp soup with spinach, and a solid gelatin dish, a veggie meat mix she use to prepare with her broth leftovers. When drinking it straight I like to dilute it with canned whole fat coconut milk – not the fake stuff now sold in the dairy aisle. Add a dash of paprika and I guarantee tastes even better than a morning coffee or cappucino, not to mention that saves you from the adrenal fatigue induced by caffeine use. Sometimes, to my daily cups I simply add fresh ginger, a dash of curry, turmeric, or a bit of fresh squeezed lime or lemon. Lately, for a more complete calcium profile, I have been adding calcium citrate that I prepare myself using egg shells. In double blind studies performed in the Nederlands and Japan, it was proven to be a safe and effective method for calcium supplementation. The studies showed that taken this way, eggshells improve bone mineral density, without significantly increasing blood calcium levels (12) that has been deemed dangerous by the Harvard study mentioned above. (*) The major biological function of proteoglycans is to provide hydration and swelling pressure to the tissue, enabling it to withstand compressional forces. Glucosamine, chondroitin sulfate, methylsulfonylmethane, and hyaluronic acid, are basically the backbone of the proteoglycans molecular structures. Joel Fuhram, Super Immunity: The Essential Nutrition Guide for Boosting Your Body’s Defenses to Live Longer, Stronger, and Disease Free. (2011)HarperCollins. Donna Gates, The Body Ecology Diet: Recovering Your Health and Rebuilding Your Immunity. (2011) Hay House Inc.
Terry Wahls, Eve Adamson, The Wahls Protocol: How I Beat Progressive MS Using Paleo Principles and Functional. (2014) Penguin Group US. Kindle Edition. Sally Fallon Morell and Kaayla T. Daniel (2014). Nourishing Broth: An Old-Fashioned Remedy for the Modern World. Grand Central Publishing.